This week saw the last stage of my original ideas for the build for Jolly come to fruition – completion of the race wheelset. The Dura Ace hubs have been languishing in the box of bike bits alongside my desk for what seems like months. It took me a long time to decide on the Velocity rims that they would be built into and even longer to get hold of the rims and spokes. 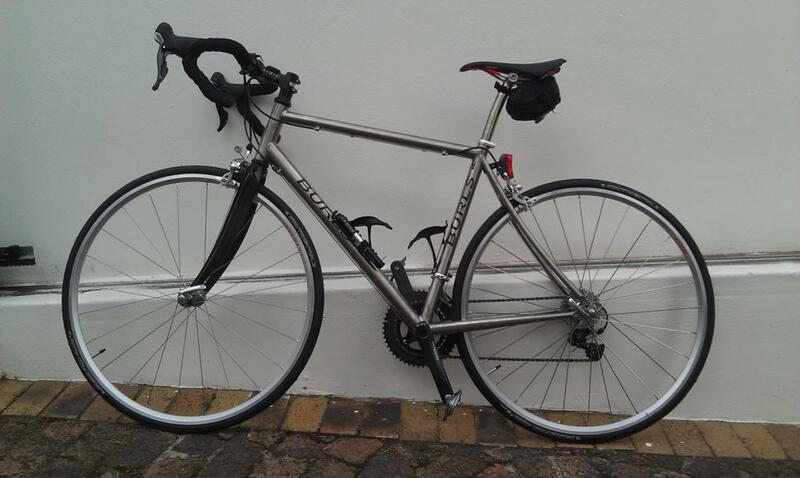 Even now, really observant bike enthusiasts might notice in the picture below that not all is quite right – the front wheel is currently laced in a two cross pattern with a standard double butted spoke. It’s a bit of a long saga, but the CX Ray bladed front spokes are stuck in the South African postal system, held up by a recent transport strike. I just couldn’t wait any longer though, with the DC just around the corner I desperately needed to get out on the new wheels and run them in and so gave William the go ahead to do an interim job with spokes he had in stock. 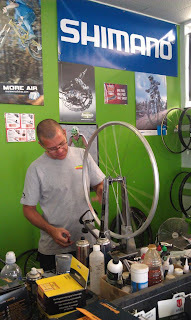 Pictured left is William doing some last minute truing when I picked the wheels up last week. I remember his comment about wheel building dying out in bike shops when we first discussed the wheel build, so I count myself lucky to have a local guy and shop so capable in the art. The Mavics which I’ve been riding for the last few weeks were also built by William, and they’ve been an absolute joy to ride – fast and true. But their intended purpose is Audax riding, and the added weight which that extra durability carries has seen me lagging at the back battling every climb on our recent training rides. I was excited to get the wheels home and fitted on to Jolly – in fact so excited I forgot to weigh them, so that’s something I’ll have to try and remember to do at some stage. The Mavics came out at 840g for the front and 1020g for the rear, so just shy of 1900g for the set. Not bad for a high durability build, but at a guess these race wheels feel to be at least 300g or so lighter. 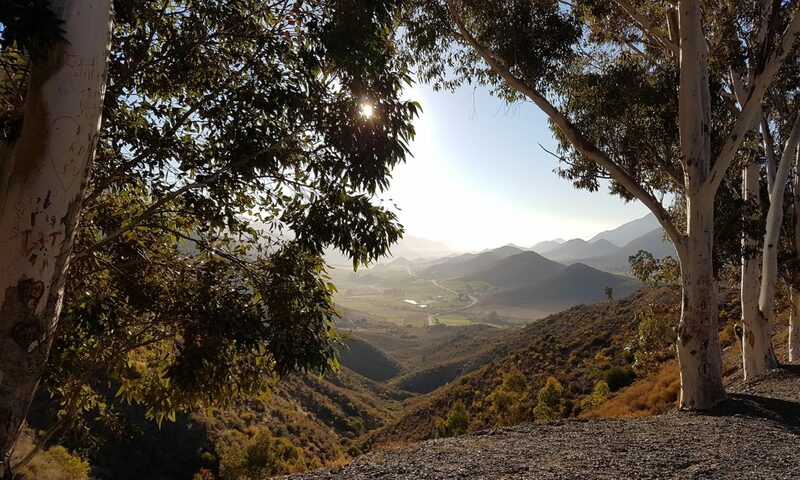 The first test ride this weekend did not disappoint either – I’ve never been a fast descender, but was easily up with the front of our group racing down the far side of Helshoogte, and despite very poor visibility we also sped down Franschhoek pass. On both descents the wheels felt extremely stable and solid. I’ve got used to the larger footprint of a 28mm tyre on the Mavics and so was expecting a few jitters going back to a 23mm tyre, but I hardly noticed the change. As for the climbs, no more hanging at the back for me – at least not because of the weight of my wheels anyhow. I was easily able to increase the cadence to keep up with the quicker climbers where I wanted too. All in all a superb outcome – they look great too. I must confess I thought the Velocity claims about the rim giving clincher tyres something closer to a tubby profile were probably marketing BS, but the tyre does look visibly rounder and seems to roll very smoothly onto it’s edges through corners. The only qualm now is whether to actually bother re-lacing that front wheel when the bladed spokes arrive. A radial lacing and bladed spokes will definitely look better, but as things stand the wheel feels extremely strong so I’m not sure if it’ll really be worth it.